There is a way to deduce the (almost!) complete evolution chart of any hero from the first 1-3 evolves. 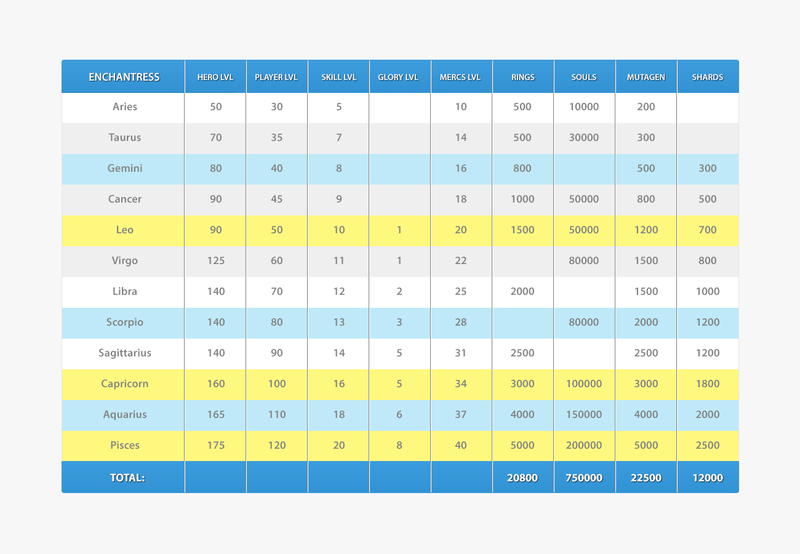 And it works a lot like one giant Sudoku puzzle – all you need is a little bit of starting info. If we assume each new hero that comes out follows the same format, this just leaves the Rings, Souls, Mutagen and Shards column unfilled. 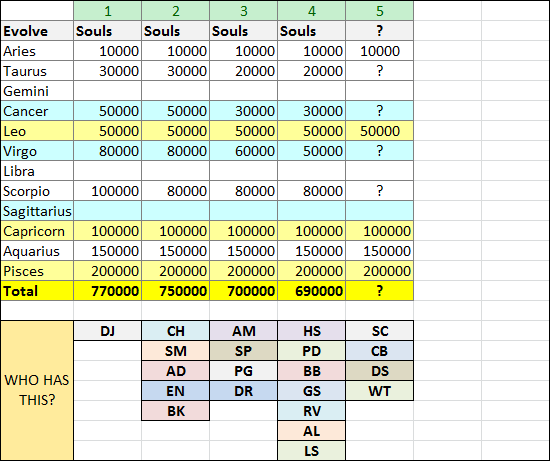 All columns have a different Aries evolution requirement, and each requirement has always given the same overall total requirement for each hero. For example, Berserker’s Aries evolution requires 500 rings. 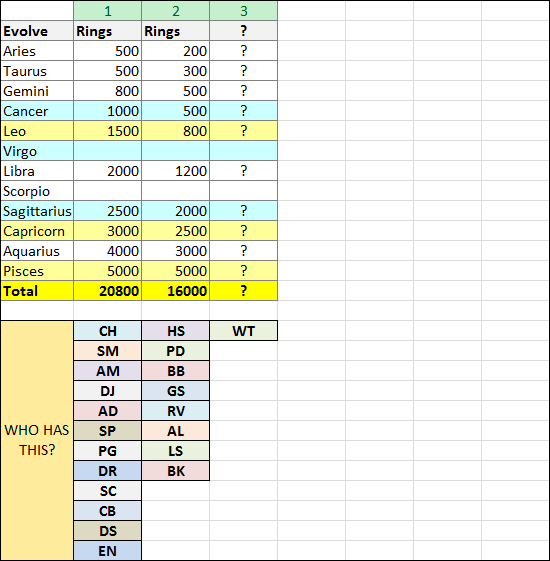 There have only been 2 variations of ring requirements, one which starts with an Aries evolution of 200 rings that gives a total 16000 overall, and one starts at 500 and gives a total of 20800 rings overall. You can check that every single hero that has ever been evolved has followed theses same requirement variations. This means that if BK’s first evolution requires 500 rings (which it does), we can very confidently assume that he follows the first ring variation – And Voila! We have BK’s ring requirements. You can do the exact same kind of deduction with his mutagen requirements. There aren’t any unique variations in souls at any level, which means we’d need to know multiple evolutions to deduce which requirement variation each new hero follows. To deduce a hero’s soul sequence we’d need to know both the costs of the Libra and Scorpio evolves, as these are the first evolves that when combined provide a unique set of requirements we can deduce the variation from. Fortunately no-one really cares about souls as much because they’re roughly the same requirements between each evolution anyway. The real kicker is not being able to deduce the shard sequences. We’d need to know the Gemini evolve requirements to narrow it down to the 12000/14000 columns, and then we’d need to know the Leo evolve requirements to fully narrow it down to the true variation. There has only been one hero (Pan Goli) who has used the 14000 shard variation, whereas you can see that almost everyone else (all the new heroes) use the 12000 variation. So we can confidently assume this is the case with every new hero. This means that to determine every evolution requirement apart from souls, we only need to know the first three evolution requirements. I can’t do the remaining heroes – Demon Slayer, Savage Chief, Carol and Won Ton – because I haven’t got any information on them. 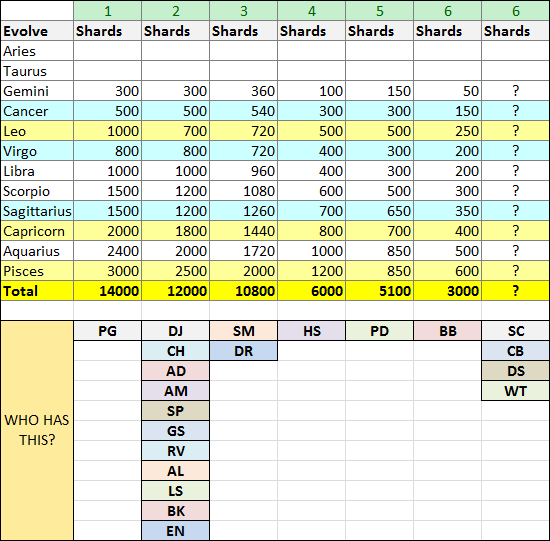 If anyone has evolved them beyond Aries let me know and I’ll make a chart for them! 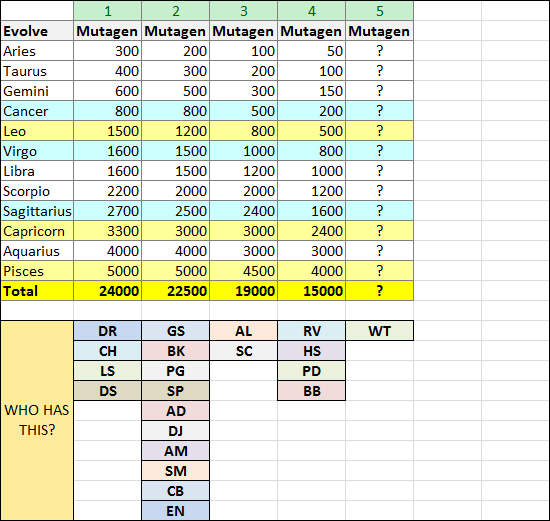 IN CONCLUSION: Just by looking at the first few evolution costs of a hero, it is possible to work out the soul, shard, rings and mutagen sequences for all evolves. Pretty much anyone can do this provided they have cost info on or beyond the hero's Gemini evolution, and hopefully this post will serve as an aid for the people who do! Because of this hopefully more people will be able to figure out these evolution charts as more heroes are released! Just to add; DS and DR needs lvl170 for divine 2. While rest need lvl 160. /can I have permission to use the data in the main thread? DS Leo costs 1000 shards which is the same as PG. I'm afraid to think that his shard totals match up because that's a LOT of rings especially since they don't give away his shards in events and you can't make his shards in the workshop. You have to spend 5k rings for 680 shards. That's 105k rings for just shards! Ouch! Then you have to count the glory which is probably 8. Thrown on an additional 40k rings. Very nice wheelie, as always. Added to another 41k for levelling up skill to 20/20 and another 21k for the actual ring requirements = a cheerful 207k rings needed overall! Which is the equivalent of 24 deity arena seasons, or 48 consecutive weeks worth. That's manageable right! Well how are you at handling a Aquarius Ambrosia?